Since 1883, Brookville Glove Manufacturing strives to provide you with the best in quality, service, pricing, and shipping. As a veteran owned business, we understand the importance for our customers’ to receive the highest quality of products; that is why we offer a large selection of gloves and safety gear that is 100% American made. 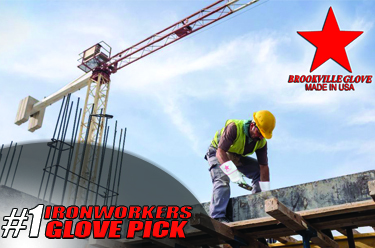 Brookville Glove provides superior hand protection for both on and off the job. For many generations our products have been the choice for a variety of people, such as iron workers, welders, glass plant employees, construction companies, farmers, oil/gas drilling labors, and lumber handling use. We can fulfill any of your hand protection needs from knit and leather gloves to vinyl-coated and flame-resistant styles. Our technical services include glove to job compatibility analysis and custom manufacturing. In addition, we offer you the choice to get your gloves hooked and tagged for your retail business. Custom printing with your company logo on any pair of gloves is also available. Brookville Glove is a skilled manufacturer with 129 years of service and is also an experienced distributor within the industry. People make the difference at Brookville Glove. Our sales force is continually working to meet the challenges of today’s industrial and retail markets. With an experienced production staff we are committed to the quality, value, and service of the products we provide. Whether you are a past, current, or future customer, we look forward to and thank you for your business.